Garse Yer Fido, Nitsi Koko Ko Ko, Untitled, Anadwofa, Mu Kun Sebor Wa Wu, Kuntum, Ligiligi, Adersu - No. 2, Abowe Dsane Nmaka Tso, Buje, Obu Kofi, Rue Bai Rue Bai, Bukay, Asin Asin Part 2, Sakyi, Jon Jo Ko, Edna Buchaiku, Akuko Nu Bonto, Ewuri Beka, Agur Bi Dzi Mansu Aba, Mukorin-Mantun, Wasiu Dowu, Alahira. Over the past few years Honest Jon’s (named for the long-standing record shop in Portobello Road, London) have released four CD volumes under the series title London Is The Place For Me, surveying African and Caribbean music recorded in the UK in the decade or so after the Second World War. The calypso material included has been excellent, but where the series has been genuinely ground-breaking is in reissuing, for the first time for a contemporary audience, a good selection of the very rare and previously little-heard work of West African bands and musicians who lived and worked in the UK in the 1940s and 1950s, including Ginger Johnson, Ambrose Campbell, Rans Boi and others. The music on those discs has been such a pleasure - laid-back, beautifully-played highlife (mostly, although there’s also a few tracks of Southern African music) mixing Ghanaian and Nigerian melodies and rhythms with cool post-war jazz - and must have won many new fans for the musicians concerned. Nevertheless, taking the decision to put out music that had been virtually unheard for 50 years and more must have been a bit of a gamble, at least to start with. Although not nominally in the series, this latest issue’s packaging places it in the same family, but this is a very different kind of selection altogether, and must have looked like a very much bigger gamble. 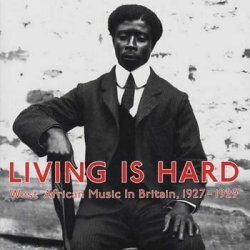 The recordings on Living Is Hard date from the years 1927 to1929, much closer in time to the music on London Is The Place For Me (which was recorded only 20 to 30 years later) than the latter is to 2008 (a gap of 50 to 60 years), but while the music of Ambrose Campbell and the like, distinctive and special as it is, sounds not at all outlandish to modern ears - there are western instruments on every track - that of most of the singers and musicians included on this disc is a very different proposition. This is music from a time when syncretic styles such as highlife and juju were very much in the early stages of development, and as a result are not much in evidence, a time when the music offered by West African musicians in the UK seemed to be very much older - even ancient - in style, little affected by outside influences. Zonophone recorded a very large number of 78 rpm discs in London in these years, mainly for export back to West Africa, where there was not yet an indigenous record industry producing for the local audience. This is not entirely virgin territory for reissue labels. Heritage released an important series from the same source (the EMI archives) back in the early 1990s, mostly whole CDs dedicated to particular artists or groups, although there was also an anthology Early Guitar Music From West Africa (Heritage HT CD 33), that appeared a bit later. What distinguishes this release from the Heritage discs is that it appears less concerned with finding the more obvious bridges between the music recorded all those years ago and the modern listener. Heritage’s selections tended to concentrate on recordings that used familiar instruments - mainly the guitar, but also other instruments such as accordian. Few of the tracks on Living Is Hard have anything of this sort. If anything, the compiler Mark Ainley appears to have favoured tracks which emphasise the separateness and remoteness of the music, or as his booklet notes put it, ‘These records are unhitched from the protocols of a white listenership’. Perhaps the best example is Ben Simmons’s untitled recording (track 3 - it’s untitled because even in those days, even for the West African market, Zonophone seems to have deemed it unsuitable for release). It’s unaccompanied by any instrument, the lyrics are chattered rather than sung and they are interspersed with what can only be described as moaning and grunting sounds. The booklet calls it ‘uncompromising possession music’ - uncompromising it certainly is, and perhaps it has something to do with possession, but by standards most people in the UK would have had at the time (or even most CD-buyers today) it is barely recognisable as music. Another of Simmons’s tracks, Obu Kofi is similar with the addition of shivering lip sounds and coughing noises, although here there are also melodic snatches and percussion beats. It seems quite clear that Ben Simmons was making no concessions to listeners who were not of his own language and culture, and as the latter track was released on record, we can probably assume that this is what Zonophone expected of him. What he created as a result are performances that are so utterly unfamiliar in character to the modern listener that they offer us a unique experience - bizarre and even difficult, perhaps, but rewarding in a extraordinary kind of way. But this cultural disconnection is by no means common to all tracks. I don’t know which country John Mugat came from, but his Bukay - lead vocals, chorus vocals and percussion - sounds to me like the kind of thing that Nigerian Juju musicians like IK Dairo might have arranged for guitars or accordion a few decades later. The antiphonal format is common to many of the tracks - a lead singer sings a line and a chorus responds or joins in, while some percussion lays down a rhythm. There is, most of the time, a clear - if limited and repetitive - melody and the rhythms are usually strong, even if often made by some very basic means, like clicking sticks. The third of Ben Simmons’s tracks Mu Kun Sebor Wa Wu, is a much more conventional song - by comparison to his other contributions, I mean - along just those lines and this time we have a translation of the lyrics, which suggest a traditional song, a lament for a dead husband who is personified as a leopard. Other translations also suggest songs that have deep roots in traditional culture, and my guess is that Prince Zulamkah’s Ligiligi, described here as ‘nonlexical’, is too. Many of these performers used English names - Isaac Jackson, James Tucker, James Brown - or even Dutch, in the case of Nicholas De Heer (whose Edna Buchaiku has a lovely, swinging, slightly funky rhythm and a compulsive call-and-response melody) and are pictured wearing Western suits and ties. Also, if the speculation in the booklet notes is correct, and it seems sound to me, most were resident in the UK at the time. And yet they had evidently by no means lost their association to a very different kind of cultural background. The fact that Zonophone recorded so many of these records, and continued to do so (one catalogue listed recordings in no fewer than 18 different languages), suggests that back in West Africa, there was an enthusiastic audience - or more accurately, audiences - who found a real connection with them. There’s a few more conventionally accessible tracks. Harry Eben Quashie’s palm-wine guitar song Anadwofa and the Kumasi Trio’s Asin Asin Part 2 both stand quite clearly in the lineage that leads to the familiar contemporary Ghanaian highlife guitar sound, while George Williams Aingo’s Akuko Nu Bonto has enough in common melodically with the kinds of songs that bands like ET Mensah’s were recording in the 1950s or 60s, and selling in large quantities across that part of the continent. The West African Instrumental Quintet’s Adersu No.2 has a distinctly Latin tinge to it; these guys had evidently been listening to some of the records coming out of Cuba, even at this early date. Incidentally, a couple of these tracks are currently still available on the Heritage CDs, so I’ll stick my only gripe in here, on the irritation of having to acquire the same music more than once, when so much remains unissued. The only other western instrument to be heard is on the opening track, where Oni Johnson’s Garse Yer Fido is accompanied by a violinist, alternating between rudimentary bowed strokes and pizzicato, adding an odd and unexpected, though very appealing, quality to the proceedings. Interestingly, the Ga Quartet, whose Paulina on the Heritage Early Guitar Music album is a melodic, proto-highlife song with piano and clarinet accompaniment, are represented here with a much more traditional-sounding performance, whose only accompaniment appears to be two bottles rattled together. They are also one of the few groups on any of these records to include a singer who is recognisably female. Although I’ve suggested above that these recordings offer a valuable glimpse of something that often appears to be very old, we shouldn’t fall into the trap of concluding that everything here is ancient, traditional West African music. The fact that a musician uses no western instrumentation doesn’t mean that there are no outside influences. My guess is that there is at least a certain amount of syncretism on display on many of the tracks here, even if it isn’t immediately apparent to the modern listener. Also, while some of the lyrics - and we can be grateful for the translations of several tracks provided by contacts at the University of Ghana - appear to be traditional in nature, others seem distinctly modern, telling of lawyers, courts and litigation, for example. So when Mark Ainley says in the booklet notes that these performances ‘disavow fusion’, I’m not so sure. Commentators more expert than me would no doubt be able to expand on this, or dispute it, so for lack of firm examples, I’d better leave it at that. I would certainly take no issue with his claim that this is ‘resilient, elemental roots music from the West African underground in 1920s Britain’. The package, as with the London Is The Place volumes, is very attractive and there are plenty of illustrations, including portraits of some of the artists, reproductions of pages from old catalogues, a Zonophone label photo and other images. The notes - acknowledging the biographical obscurity of most of the actual people involved - do a good job of setting the recordings in their historical context. In this way, the presentation does considerable justice to music which is by turns engaging and bewildering, puzzling and exciting, very strange and quite beautiful.